I will finally get this off my design wall. This morning I finally made the last 6 blocks I needed for the top. This has been up on my wall for... oh a mere 3 months. It's time to get it done and put something else up. These were blocks made by members of my LQG. I won the drawing and these lovely blocks came home with me. It took me a long time to get each and every block squared up to 8.5"x8.5" They are not perfect but since I squared them up on the diagonal (or as close to it as possible) you can't even tell. Well that's not entirely true, you can tell that some blocks are just a wee bit wonky, but at least it not screaming at me anymore! I was surprised at the different levels of piecing and the vast difference in finished size of the blocks. The biggest tip I can give you is to really work on your 1/4" seam allowance!! 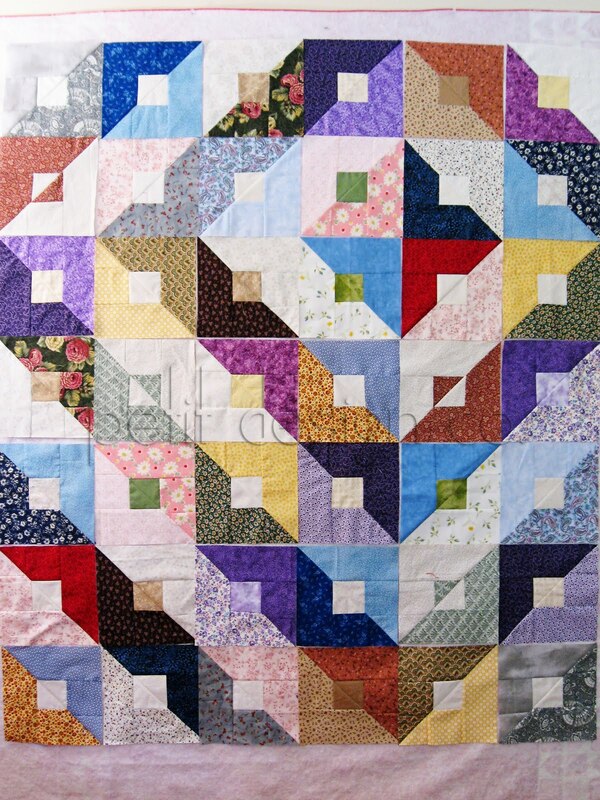 Perfecting this will bring your quilts to a whole new level. I guarantee it. You can read more about the elusive 1/4" seam here, here, and here. The pattern is Mock Log Cabin/Paradigm Shift featured in McCall's Quilting May/June 2010 issue. You can find free pillow instructions here. The large pillow blocks are the exact same construction/size as the ones for the quilt blocks, just arranged differently. You need 42 blocks to make a 52x60" quilt. I love your layout. You did great with these!